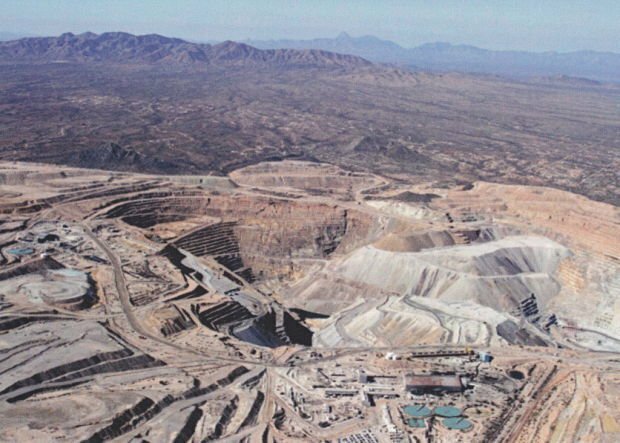 The Asarco-operated open-pit Mission Mine south of Tucson is one of its four Arizona sites..
You could almost call Asarco LLC’s behavior refreshing. Over the years, the Tucson-based copper-mining company has made no pretense of being Southern Arizona’s friendly corporate citizen. Under the ownership of Grupo Mexico since 1999, the company has been brazenly self-interested, even short-sightedly so, from the time it cannibalized its equipment for parts in the early 2000s, to the time it forced a strike in 2005, leading to a four-year-long bankruptcy, to its constant battles with its labor unions that continue today. Now, the company is throwing good money after bad, fighting a losing court battle over bonuses it owes some workers but doesn’t want to pay. It’s unclear how much exactly the company owes, but it is probably north of $10 million. Considering that the company has been fighting paying the bonuses for at least five years — first in arbitration, then in a lawsuit in U.S. District Court, then in the Ninth U.S. Circuit Court of Appeals — it has undoubtedly amassed big legal bills. How much? It would not surprise me if they neared or topped $1 million. In essence, Asarco has been paying its lawyers to fight its workers instead of just paying its workers, the ones who work at three mines and a smelter in Southern Arizona as well as a refinery in Amarillo, Texas. This current conflict is an outgrowth of more than a decade of hard relations with the United Steelworkers and other unions representing Asarco workers. That broke into the open with the 2005 strike, but has been regular since the company emerged from bankruptcy in early 2010. On July 1, 2011, an agreement between the unions and Asarco took effect that said new hires would no longer be enrolled in the company’s defined-benefit pension program. The new agreement said nothing about the existing copper-price bonus, which paid a lump sum to each employee every quarter, based on the price of copper. But the previous agreement had said that the copper-price bonus was to be paid to workers enrolled in the pension plan. Soon after the new agreement took effect, in July 2011, an Asarco human resources administrator noted the problem: Since newly hired workers were not in the pension plan, it could be argued they were not qualified for the copper-price bonus. You can imagine cackling laughter rippling down the corridors at the Williams Centre on East Broadway, where Asarco has its headquarters. In September that year, the company informed the Steelworkers that it was planning to take advantage of this contractual oversight: The company would not pay the copper-price bonus to those hired July 1, 2011 or after. The union objected, but the company would not give. Year after year, it has fought, first before an arbitrator, then in the courts. The arbitrator, Michael Rappaport, ruled in December 2014 that leaving new hires out of the copper-price-bonus program was a “mutual mistake” by the two sides. It was just an accidental by-product of their agreement. Rappaport moved to correct the error by including those new employees in the program. Asarco chose not to argue, implausibly, that the company had intended to remove the copper-price-bonus from new hires. The facts of the case make it clear nobody intended that. Instead, the company argued that the arbitrator was exceeding his power by correcting the error. Seems common-sense, right? Not to Asarco. In January 2015, the company sued the Steelworkers in U.S. District Court, arguing that the arbitrator exceeded his power by adding on to the contract in order to correct the mistake. Note that phrase: the “true terms of the parties’ agreement.” Asarco never intended to take away the copper-price bonus. The company simply found a loophole and tried to exploit it. Rather than accepting the ruling and moving on, Asarco chose to continue paying lawyers instead of the workers mining its copper. The company appealed to the Ninth Circuit, making the same argument, that the arbitrator had exceeded his authority. A three-judge panel first rejected the argument in June, then the panel revised its written opinion but rejected Asarco again in December. Asarco asked for an “en banc” hearing with a full panel of Ninth Circuit judges but was rejected Jan. 10. The company has 90 days from then to decide whether to appeal to the U.S. Supreme Court, where few cases are accepted. It’s time for the company to stop throwing good money after bad and pay the workers the money that the company expected to pay them anyway. That won’t make it Tucson’s friendliest corporate citizen, but at least it can stop wasting money on lawyers in a failed bid to exploit a mistake. Latest rejection leaves a Supreme Court appeal as Asarco's last chance to avoid paying millions of dollars in bonuses.